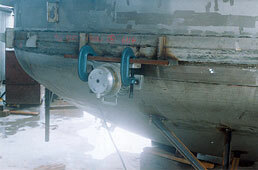 In addition to being more effective than traditional furnace treatment on dimensionally critical components, vibratory stress relief has expanded both the range of metal components and the applications that benefit from effective stress relief, far beyond either the cost-effective range of thermal stress relief or, based on workpiece size or configuration, its practical usage. Components which are either too large for available ovens, or too costly to transport. Further, because size and transportation costs are no longer limitations, the vibratory stress relief process has, in many instances, also enabled one-piece designs to be utilized. Machine tool components which should be stress relieved after rough machining, to reduce the effects of machining stresses that interfere with achieving final machining tolerances. 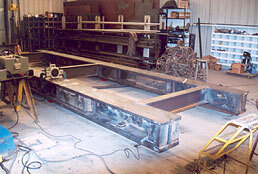 Welded structures that need to be hot dip galvanized (HDG), to minimize the distortion that can take place during HDG. Plate stock in preparation for laser cutting, to reduce the distortion which interferes with the cutting process. Weld repairs performed on-site, because they are too difficult or too impractical to thermally stress relieve. Components that cannot undergo thermal treatment, due to a plant’s inability to economically or effectively remove scaling (the oxidized skin that forms on ferrous materials while in a furnace). Bi-metallic and multi-metallic components, components that typically cannot be thermally treated. Surface-hardened components in preparation for final machining, the surface-hardening process can generate residual stresses that interfere with final machining tolerances. As a preparation for both final machining and dynamic balancing, by reducing residual stresses left in critical components (even if only machining stresses), that must maintain not only tight dimensional character, but also tight balancing requirements. As a means of minimizing and stabilizing damping of a large, critical moving element in a machine tool. Interactive compensation for the dynamic behavior of the machine would require stable damping characteristics. The vibratory process monitors several critical dynamic parameters of a Workpiece, and utilizes their stability to determine completion of treatment. The use of lo-carbon, high strength steels in machinery design where critical dimensions are required, metals that, otherwise, could not be used because they should not be subjected to thermal treatment.